A Bacchanalian procession through the streets of Edinburgh; movements on the Crinan Canal turned into a sculpture; the UK premiere of Venice Biennale artist, Bettina Hutschek; all set alongside specially selected artworks from cutting-edge contemporary artists from Scotland and beyond: the Society of Scottish Artists Annual (SSA) Open Exhibition opens on 31st October at the Royal Scottish Academy in Edinburgh. 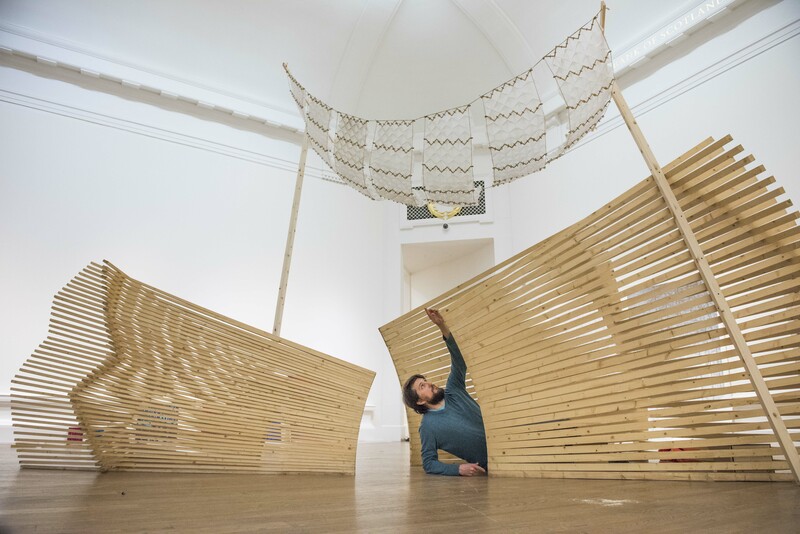 With a mission to promote and encourage experimentation and the adventurous spirit in contemporary art, the SSA is presenting its 119th Annual Exhibition with a line up of work by established artists based in Scotland and internationally and new artists. This includes invited graduates from Scotland’s principal art schools, installation, video, computer and performance art, which are set alongside a strong core of works in traditional media resulting in a challenging and invigorating show. Invited international artist, Bettina Hutschek, who has been chosen to represent Malta at the 2017 Venice Biennale and has never before been shown in the UK. She will show a film entitled HAUS 209 (House 209), which will be given prominence in a specially designed space, alongside printed stills. The film tells the story of a woman who is used for a dystopian experiment to travel to the ‘world beyond’. A second artwork based on Maltese proverbs will also be included in the exhibition. Anya Gleizer (part of La Malle des Indes collective), who will present a Bacchanalian procession through the streets of Edinburgh in Dionysus Lives. Exploring themes of interior and exterior wilderness through performance and intermedia-installation, her pieces involve the participation of multiple performers and audience members, calling for full involvement with the work. An installation from Edinburgh-based artist, Juliana Capes. She received SSA Exhibition Award in 2015 for Aquifer, a sweep of half-filled and graphite-smeared balloons, the glossiness of their surfaces interacting with paint and powders. This year she presents a new installation for the main gallery space entitled ‘Diaspora Paradiso’. A piece presented in partnership with New Media Scotland by artists ~In the Fields. This artwork is a device that has taken live data relating to each of the 15 locks on Argyll’s Crinan Canal, creating a kinetic parametric architectural structure in response. 52 by Michael Popper, an accomplished director, choreographer, musician, actor and dancer. His work reveals an ongoing interest in breaking down barriers between the art forms, and in experimenting with taking the resulting hybrid works into galleries and other public spaces. Forgotten Lives by Will Vernon, a recent graduate from Grays’s School of Art in Aberdeen. This series of photographs explores the space with which those living with dementia surround themselves. A section of the exhibition, Sit In/Take Away, also allows visitors to browse an array of affordable original artworks, which can be purchased, wrapped and taken away on the same day. The works encompass a variety of media including printmaking, painting, drawing, photography and mixed media. The SSA Annual Exhibition is open daily from 31st October to 24th November 2016 and is free to enter. The SSA has long aimed to represent adventurous work from Scotland and further afield with exhibitions including the work of the Post-Impressionists, Gauguin, Cezanne, Matisse and Van Gogh in 1913. In 1922 the Society presented work by Picasso, Daumier, Degas and Forain. In 1931, the Society showed, for the first time in the UK, twelve canvases by the then highly controversial Edvard Munch who went on to become a member of the Society. The SSA today continues in the spirit of its founders, to show the controversial and the unexpected and to give hanging space to new artists of promise. It also regularly exhibits work from artists drawn from many areas overseas. In an art-world where the divide between new genres and traditional media has rarely been wider, the SSA plays a unique and vital role in bridging the gap. The SSA is an artist-led membership organisation that is governed by an elected president and council. For more information on the SSA and exhibition visit www.s-s-a.org. Bettina Hutschek (born 1977) is a visual artist and curator who lives and works in Malta. She studied Fine Arts, Art History and Philosophy in Florence, Augsburg, Berlin, Barcelona and Leipzig and spent one year as Visiting Scholar at TISCH, NYU. Today, she uses fragments of different realities to examine the possibilities of knowledge transfer – that is: to tell stories. She is founder and director of FRAGMENTA Malta, a project to organize pop-up exhibitions in the public space of the Maltese Islands. For more information on Bettina Hutschek, visit bettina-hutschek.com.